My MacBook Pro is pretty much dead, which happened very shortly after I got Affinity Designer causing me to search for a new laptop to use affinity on! I then realized some of the computer reviews say most laptops can't display all of the Adobe rgb colors and Adobe rgb contains the cmyk colors; the laptop I had considered first could only display 60% of the Adobe rgb colors. I don't want to have to spend a ton of money, but I also don't want to think I'm designing with a certain green and have it print a totally different green even with gamut check on because my screen can't display all the colors it should for designing. What computers or iPads do you use for designing to get accurate colors or recommend any drawing tablets? I really want to be able to draw and have accurate colors! Thank you in advance for all your help!!! I'm so excited affinity Designer just came out on the iPad! Also, I would love a 12.9" iPad pro but don't know how to get a new one cheap or when the next ones will be realeased? I figure this generation would be best because it has the better color and processor for designing. Is the 10.5 really small after a while for designing? A lot of people say they like drawing on it better than drawing monitors for many reasons. Which do you prefer? Also, if I got an iPad, would that transfer or count as one of my operating system devices licenses seeing you can have affinity on multiple devices you own with the same os? Or would I have to purchase affinity again? What internal storage size do I need if you do recommend an ipad for all the design files plus apps? And is there any way I could use a connector cord to a regular toshiba 3 terrabite hard drive to store my designs on there? Also﻿, if I got an iPad, would that transfer or count as one of my operating system devices licenses seeing you can have affinity on multiple﻿﻿ devices﻿ you own with the sam﻿e os﻿? Or would I ﻿have to purchase af﻿fini﻿ty agai﻿n? You mention iPad almost as an afterthought. Since your OP and your huge long topic title (hoping for a prize, perhaps?) are mostly about laptops, this thread doesn’t really belong in the ‘Affinity on iPad Questions’ forum. Perhaps Gareth or one of his colleagues will move it. Anyway, to answer your licensing question: Affinity licences are per platform — macOS, Windows, or iOS — so the iPad version would be a separate purchase. Thank you, Stokerg, for your quick and courteous reply!! :D. I have been debating on the middle storage size or the largest, because I thought the files probably take up a lot of space and I also like a lot of apps on my old little ipod (8 years old lol still going strong!). I've never had the opportunity to have an ipad in the past, but I've been really concerned about it not displaying the same color space for designing...I really don't want to have issues with my printed products (like pillows, phone cases, t-shirts) being totally different colors than what I see on my screen even though they might be in gamut. They aren't printed nearby so I can't compare unless I order one every time. I've been really considering getting an ipad though!! Yeah, hopefully someone will comment if it is definitely possible to connect a regular external hard drive to the ipad, because from what I had seen, it didn't seem that possible. I've always wanted to get one, I just need some perspective, wisdom, and recommendations from people like you who do this all the time what is best to get for accurate colors. :D. Thank you, again, for taking the time! Matching colours is such a tough subject. Made 10 times worse when you are printing on fabrics. I spent a lot of time trying to do this for litho and silkscreen printing and it never works that well. I must admit I don't know anything about printing on things like pillows but know something about tee-shirts, as long as you are talking about four-colour process and trying to match colours is very tough. The biggest problem is dot gain, which is where the dots of the printing enlarges when printed. This is a big problem on material, as ink soaks in and spreads. If you have ever spilt something on a new tee-shirt, you will be very familiar with the process . That is where using the correct printer profiles comes in. Another problem is that the "white" of the fabric varies. The last thing you want for matching is a computer that displays lots of RGB colours. Because no matter what is displays, the printer can't print. Printers use three colours plus black and can print only a fraction of normal RGB, let alone Adobe "full" RGB. What you need is a monitor that is calibrated. Using something like a Spyder colour calibration device, it will try and match what you see to what you print. That will mean making your display look dull and muddy, because that is what your print will be. Pretty much any computer screen can display CMYK colours but the screen will need to be calibrated. That means a proper monitor, a calibration device and proper software. So forget laptop screens and especially, forget iPads. Even then, I'm not sure how well this will work when printing on fabrics, but it will be a damn sight better than using an iPad. However, what are you printing? Are you trying to match something like a photo, or creating patterns. If you are printing patterns, then I would normally expect that to be done using spot colours so that whatever colour you want can be printed, just make sure you select the "u" (uncoated) colours, not "c" (coated) colours. Choose a colour from a swatch (Pantone) then you printer can match that because that is the colour of the ink. Trying to match it on the computer does not apply. Just design using spot colours from the swatch but again, forget iPad because Affinity Designer does not support creating in spot colours. Unless there is something physically wrong with you Mac, you would be better off to buy a separate monitor and a calibration device. I am not sure how this works with Macs but it works on a PC laptop. Or, if practical buy a Pantone swatch and use spot colours instead. Thank you so much for telling me about all of that! I totally agree!! It is very complicated and controversial I'm noticing! I had only heard of calibrating a monitor, but have never done it, nor do I really know what to calibrate it to exactly. I hadn't heard of the Pantone colors yet. The printing companies would print my designs and sell them online so I wouldn't have access to them unless I ordered a product every time. I looked up again what kind of printing the two companies use, and on Redbubble's site, at some point, they wrote: "For our basic mens, womens & kids apparel we use direct to garment printing, which involves applying a pretreatment before loading the garment into a printer. This ensures the prints sink into the fibres of the textile, making them much more long wearing than traditional ‘transfer’ prints, which just sit on top. Our full bleed range, which includes products like the graphic tee, leggings, scarf & A-line dress are created using a different technique called sublimation printing, which uses heat sensitive inks. Under heat, these inks turn into gas and combine with polyester textiles. Since the ink becomes part of the structure of the material, the images on the fabric don’t fade or crack, even after many washes." Teespring says " Color system: We use an RGB workflow. Our DTG machines print Red and Green, as well as the traditional CMYK, which allows for a larger color gamut." As far as design profiles, Redbubble told me for designing : "Our printers (and all printers in fact) print in the CMYK color spectrum which is a mix of cyan, magenta, yellow and black. 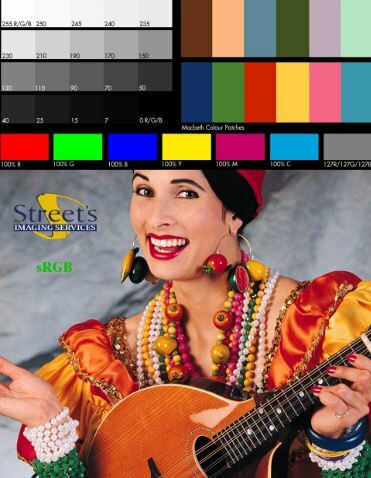 Most digital images default to the RGB spectrum and we try to match as close to these colors as possible. If you want to get your digital image looking as close to what will print, it’s best to design your image in CMYK right off the bat, especially for cloth products like t-shirts. Please ensure that the image you’re using has been converted over to CMYK. You’ll notice that the photo/design’s values will be dulled down a bit but you’ll be able to adjust the saturation and tones in your photo-editing program to the brightest CMYK colors. You can then save the file in sRGB and upload it to Redbubble. This is the general rule when printing work. If you’re simply displaying a graphic online and have no intentions of printing it, an image saved in RGB will be just fine. However, to avoid any surprise colour differences in print, it is always recommended to start off in CMYK....The generic CMYK profile will work just fine for printing. As for the RGB mode, we suggest using sRGB before uploading. It sounds like this would be RGB/32 in this case....We are unable to advise whether "print" or "print press ready" will be best for your work, as we are not trained experts with using Affinity Designer. As long as your image is saved as a PNG in sRGB, this will be suitable to print for the third party printers we work with. We recommend saving the image as PNG 8, as this will produce a smaller file size which will be much easier on our server As for your photos, it's good to get into the habit of double-checking the colors are to your taste in CMYK to begin with. You can then switch to sRGB before uploading as well." Teespring said for design profiles they print in a full spectrum of color, and it was up to me to use cmyk or rgb. Would the pantone colors work/apply to both companies then? It sounds like you're saying that the computer, which the external monitor is connected to, won't effect the external monitor's display then? Also, if I understood correctly, I would need a desktop and external monitor or just a desktop computer to calibrate? Or I can get any computer to calibrate with swatches? And Would affinity designer still work for any of those printing processes? Can I design/draw on a screen drawing tablet monitor or an ipad connected to an external calibrated monitor? Or how can I draw to design or use affinity on what kind of projects? Cards maybe? Well, now I know the process, it makes it easier for me, but harder for you Forget what I said about Pantone spot colours, that won't happen with the Direct to Garment process. Absolutely the first thing you need to do is sort out your viewing. I am not a fan of using laptops because the displays are not really designed for colour accuracy and the colours you see on screen can change depending on viewing angle and ambient lighting. However, assuming you don't want to buy a new computer and monitor just yet, you must calibrate what you have, Buy a Spyder (or similar) calibration device https://www.datacolor.com/photography-design/product-overview/spyder5-family/ they are not expensive and you can use it on any computer. After calibrating, make sure that you always view your laptop at the same angle and under similar ambient lighting conditions. Obviously, you can design anywhere, but view the colours where you can assess them properly. (and consistently). Make sure that the laptop is always plugged in to the mains as most dim the display to save batteries when not plugged in. Because of the type of printing process, you will need to do some work. First thing is to design a calibration page. Something with a stock photo and a range of colours on it. Something like this from Adobe. or use that, search for Adobe Calibration Image. If it is 'off colour', this is where Affinity's Soft Proofing might come in handy. See if any of the preset profiles get the colour close .Under no circumstance adjust your calibrated screen !!! Design something you like, apply the soft proof layer temporarily and that should be pretty much what you will get. Some colours just wont look good, like oranges and greens because CMYK can't reproduce them. It is all about being able to design something that can be printed! Not the other way round. Remember that the soft proof layer is only there to temporarily adjust you monitor for viewing. Make sure you delete it or turn it off before sending your design to be printed or it will mess up the whole process. That's the best place to start. Ok, I will forget about the pantone colors then. lol Unfortunately, I have to get a new device seeing my laptop is way overheating, battery has to be replaced, its old etc..; right now I'm trying to move soon so I can't get a monitor and set it up seeing I'm not in my new home yet... I would like to have something portable for now and later....as well as maybe a desktop computer after I'm moved or external monitor if needed. So then, I think you are saying I have to have the two companies print an adobe color page on the products while I calibrate my future laptop/desktop/external monitor, then when the products arrive compare and adjust in affinity designer on the color gamuts to the calibrated screen? Will that adobe page cover all the colors I might want design with (in cmyk or rgb on the other) or as long as the ones on the page are correct with the monitor then all the rest of the colors in the color space/gamut will be just fine? I'm still not quite sure what I should or need to purchase for designing on next.... Are drawing tablet monitors an option to use or just use an imac desktop or any comouter/ipad with a calibrated external monitor because the external monitor is not effected by the ipad/ computer colorwise once calibrated? If not convenient for now, buy a laptop but try and get one where the screen display does not appear to change too much as you alter the viewing angle. That will probably do you for a while but be careful how you view it (as I described earlier). Use a calibration device on it!!! With the RGB workflow printer, get your proofs made and use a soft proof to match the display to the proof (more or less). If you are designing in CMYK for the CMYK workflow printer, I would recommend that you use a different approach and buy a Pantone CMYK swatch. Not a ‘normal’ Pantone colour swatch. You need the uncoated part, because obviously materials are not coated. That will show you what CMYK colours should look like when you use them. Then it’s up to the printer company to match them. Don’t try to do it visually on the monitor, that’s too much like hard work Literally, ‘print by numbers’. Design a test page in CMYK using the swatch colours and get that printed but talk to the printers first so they know what you are after and ask for advice. Especially about using Pantone colours etc. They will know best. A CMYK swatch is interesting because it’s amazing how it shows the limitations of using just cyan, magenta and yellow inks with some colours. Thank you so much for all your help!!! I just wrote to the printers again today about Pantone colors, and calibrating, and getting some samples of my products. We'll see what they say; they're not always all that helpful, sometimes though. And 2), what to calibrate the screen to for cmyk or rgb, or will the calibrating software lead me through how to set it? Yeah, lol, it probably is hard work to match most colors just by eyeing it. Thanks again!!! I really had no idea what direction to head for color accuracy. Forget RGB, you are not calibrating for RGB as both your printers print use CMYK inks. Only monitors use RGB, which is the problem between display and print that affects everyone. The problem is, one printer uses a CMYK workflow, one uses an RGB workflow, which makes things a bit more complicated for you. At the end of the day, your file has to end up as CMYK because that is what printing inks are. So, it must either be designed in CMYK or converted from RGB to CMYK. If you design in CMYK you are doing the conversion, if you design in RGB the printer is doing it. Because the results will vary due to the different workflows, you will need to compensate for that. That is where Affinity’s Soft Proofing layers come in handy. You only need to calibrate your screen once!!! You are just making sure you get a constant and accurate display. Monitors vary a lot, especially laptops (for the reasons I mentioned above) so you need an accurate reference. That won’t help much with matching the printing (especially in your case due to the the different materials) but soft proofing layers will. I would still buy a Pantone process colour swatch. It really helps to see what colours can actually be produced with CMYK inks. Many colours you see, especially on screen, just can’t be printed. So better to pick colours that can, or you will never be able to reproduce them as you would like. And if you design in CMYK it will help. Oh sorry, I meant red and green when I said rgb really. It was a little confusing seeing teespring said they can print red and green as well as cmyk. So then, to make sure I'm understanding what calibration does: it will change the white balance and other colors to a good balance, but it won't be setting my screen to cmyk colors. Then viewing the soft proof in designer will be a more accurate display of the cmyk colors because my screen is balanced so to speak. (I had been using the soft proof layers and removing them before sending my files just having started in designing before my computer died, but hadn't calibrated my screen. oops lol. I was afraid to but getting more comfortable with the idea now. I will calibrate my next one!) If the above statement is wrong, Can the calibration software set my screen to cmyk colors? Also, if I were to edit photography it would probably need to be on a separate monitor if that were the case or can I turn that custom calibration profile off temporarily? I've been looking into the pantone swatches and found out there is a calibrator called X-Rite and Color Munki, smile, photo, etc ...which is tied to pantone and people say it has more features/shows and tests more than the spider. Is the x-rite the best kind to get and do you need one better than the smile, or the more money=the better job it does? Does a calibration device replace the idea of downloading an icc profile then? It looks like you can calibrate an ipad or a phone now with some of their devices the x rite color true I think it was and maybe the idisplay. Also with a kind of spyder datacolor maybe. Not sure on all the names off the top of my head. Waiting to hear from Redbubble, but Teespring says they do match pantone colors. Yes, I agree, it's best to know what is going to print before rather than when its too late! I also realized affinity designer supposedly has pantone colors in the swatches panel so then if I bought the pantone swatches book, and set my objects to the same color in the software, would a soft proof be necessary or only to tell if it fits in the cmyk gamut? Can you use pantone colors from the swatches panel if you're in cmyk 8 design profile/color space (not sure what you call it in affinity designer's settings for your project of cmyk). Thanks again for your patience and wisdom, I'm feeling like I'm starting to get a better understanding of this whole new world of design and color for printing. Probably still missing pieces, but hoping it will all fit together someday. Basically, the calibration device will only make your screen display accurate RGB colours. It’s the Soft proof layer that will make the Affinity RGB image look closer to CMYK. You can’t download an ICC profile for your screen. The calibrator has to actually “see” your screen. It’s like me saying your screen is too bright. How would I know ? . Any device should be fine, Spyder , Munki or X-rite. I have a Spyder, so can’t comment personally on the others. If you set the Pantone colours in Affinity, using the CMYK Pantone Swatches in the swatches panel, you will then be using the physical Pantone swatch to see what those colours will actually print like. The print colours will/should look like the physical swatch colours. It doesn’t matter what they look like on the screen so you don’t need a Soft proof layer for that. Just do it by numbers. P.S.- Just heard back from teespring and I had asked about their printers specifics, how it works on their end exactly. "You can use whatever Pantone series you would like as our system will match the colors when uploaded. You can design using either RGB or CMYK and it will be matched by the printers we use. Keep in mind that while we do call out all pantone color that print items will appear slightly different than a digital image on a screen. Since the use of RGB and CMYK for best results differs depending on the material being printed on our system will replicate both as needed. " I asked them after that to be clear, "The printer is converting an rgb design then to cmyk inks?" and they said "No, our printer can print both, there is no conversion." So I'm assuming they must have a different printer then? There is no such thing as an RGB printer. RGB is light. CMYK is ink. If you mix Red and Green light, you get Yellow. If you mix Red and Green ink, you get Brown. Thank you, that makes a lot more sense now! Lol I don't even have a monitor really right now so if you've seen it, you're really good! Haha I do need to figure out what screen/computer exactly I want to get next. Yeah, my only concern was if it was calibrated to cmyk colors then I wanted to edit a photo or read something online I would need a separate monitor because the colors wouldn't be as bright. Lol. I was getting hung up on what calibration did and what I was changing my screen to exactly. Ok, any calibrator company, good to know!! I just couldn't know if pantone colors were available in affinity d. when designing in the cmyk profile, without a computer right now. Yeah, I haven't gotten into serious photo editing yet, but I plan to get more into that as well! Hmmm, that's really weird they said that then... So the other thing I'm hung up on is seeing they said their printer can print red and green and cmyk though for a larger color gamut and an rgb workflow , how would the red and green part effect my work if I tried designing in cmyk? Cmyk doesn't have red really or green? If I design in rgb then the printer converts it to the closest colors. I expect it’s a “lost in translation” thing. Printers use CMYK as the basic inks because mixing them gives you most colours from inks. Mixing RGB inks just would not work, as I said, you cannot get yellow. What they might mean is that their printer has additional inks, as well as CMYK. It is not uncommon for printers to have 6 or more colours to increase the range of colours they can print. I have a Canon inkjet printer that has 8 inks. As well as CMYK, it has red, green and a lighter ‘photo’ version of Cyan and of Magenta (for subtle toning). The red and green inks really help because oranges and greens especially, are very hard to produce with CMYK. The green ink is obvious and the red mixes very well with yellow to make orange. That would explain why they use an RGB workflow. The wider colour range of RGB can be translated into CMYK+RG (might be more colours) to give a much wider printable range. If your image has already been converted to CMYK the extra colours of RGB have gone forever. For that, calibrating your monitor and using Soft proofing layers should be ideal. From X-Rite, i1 Display Pro works great for me. Over a NEC Spectraview (a NEC produced in Europe that used to get calibration from default, which I calibrated on my own, and do so often. Didn't have the bucks for an Eizo, this one was already expensive, sigh....). To my continued surprise, a lot of the print companies with which these small business owners and all sort of individuals use, they tend to use some sort of RGB based workflow. Or probably, that they know their users have often even less clues than me about color management, and know that all they are going to get is a PNG or bad JPG.... I have found a bunch of them stating in the docs that they don't accept CMYK files ! I typically ask the project author where do they intend to print (the pain is when they do decide that at the very end of the project, as they plan to hunt for the cheapest printing deal) , so I check the online POD printing company docs, some hide it stupidly well, and in some cases, they don't have that, so I ask the person to forward my exact questions to them. Usually is very well documented. What CMYK profile they want, which level of ink, or if they want just sRGB based files (very frequent), resolution, they typically even provide templates in several formats, already with their bleed, cutting guides, etc. In general a cmyk file with the profile they needs is wat gets more accuracy, but at times is the opposite. With a few I just have seen that the best is provide a good sRGB file (anyway, I control that no tones get out of range of the usual CMYK profiles). The laptops , at least PC based, which are the ones I know, tend to be pretty bad in Adobe RGB color space support. And have typically more issues. Older ones indeed used to be only TN panels, and those are the worst for color accuracy (with some rare exceptions), also because degrade the image colors per angle a lot more, some require that u have your head fully straight over it, not even in a slight angle. If is an IPS or VA panel, that's a lot of a better case, being IPS generally safer (VA generally very good for contrast, deep blacks and subtle "whites" ). So... I think u can use a laptop, but I'd definitely get an external monitor. Pity is that most semi professional (and professional ones) monitors tend to be pretty heavy, among other things for having a more solid support, capable of many more positions, etc. So, kills the portable matter, BUT, if you get one, and do calibrate the best u can the laptop screen, you could still carry it for work for lines-only stuff, sketches, non graphic work, knowing , surely with time where and how color aberrations happen... as you would often compare the two screens. They also tend to suffer from light leaks in the outer areas, and lighting uniformity issues, which is horrid as will display colors differently on screen depending on the area. Usually a good semi-professional monitor has all these things sort of minimized. Personally, I prefer even for the constant moving situation, unless if it is carry the laptop everyday from hoe to work, if is only that you move every x months, I prefer just a powerful machine, but a mini-tower, can be very lightweight, I used to carry in latest company one under my arm in the bus when every x months I needed to "build my seat" at the company, as latest years I became a remote worker. U know, sometimes even these have to work in-site. I can imagine that for someone who moves from time to time, can put the mini tower in the back of the car, no biggie (some ppl might remember my every week-end travel anecdote with a large CRT there). Latest years my workflow is very specific, I often just work in sRGB. But in the past, specially working at a company where I made all print material for it, no online printing companies, I used to work in RGB and then convert to CMYK to the needed profile at the end, but with several checks in the middle. OR... working in CMYK mode from start. That was typically with a PS CS2, during many years. I used to carry the stuff to the print company my self, and do some test prints there, to ensure everything... no big issues.... Even if the process was extremely far from perfect. What﻿ the﻿y might mean is ﻿that their printer ha﻿s additiona﻿l inks﻿,﻿ as w﻿ell as C﻿MY﻿K﻿﻿﻿. Teespring mentioned Pantone colours, so they probably just meant that they would use the closest available match for whatever CMYK or RGB colour the customer specifies.